A satellite view of Hurricane irma on September 5, 2017. “2017 turned out to be a very active season. We had 16 named storms. 10 of those were hurricanes, and 6 of them actually turned out to be major hurricanes, which are category 3 or higher,” Qualiariello said. According to Qualiariello, 2017 is the second season in a row to have above normal tropical hurricane activity, both in terms of the total number of named storms and the number of major hurricanes that occurred. 2016 represented fairly similar activity with 15 named storms and 7 hurricanes, including 4 major hurricanes. 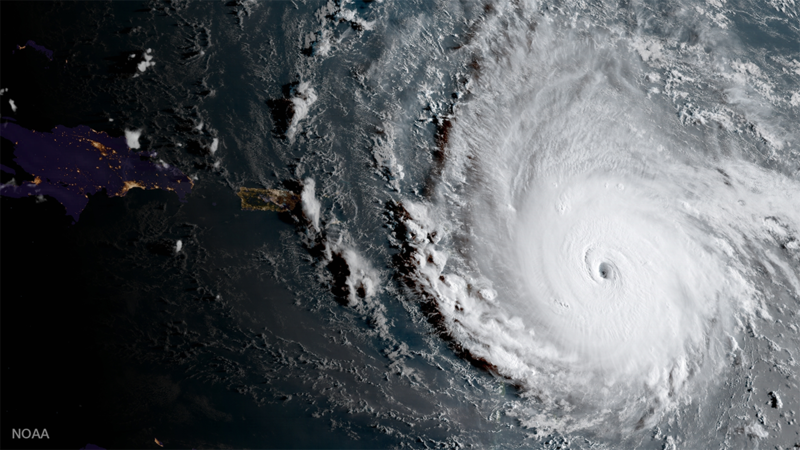 The biggest weather-related threat to South Carolina in 2017 was of course Hurricane Irma, one of the season’s fiercest hurricanes, which was a Category 5 storm when it made its initial landfall in Cuba. Ultimately, South Carolina missed the brunt of Irma’s force when the hurricane veered west of its projected path. That’s not to say, however, that South Carolina didn’t receive serious impacts from Irma. While the Midlands and even the Upstate dealt with power outages resulting from Irma’s winds, it was the S.C. coast that received the greatest impact. “I think maybe one of the greater impacts that people weren’t anticipating was the storm surge flooding that occurred along the coast, where we saw the inundation along the coast actually be greater in some parts of the central and Southern part of the coast than we experienced back in Matthew last year,” Qualiariello said. This made the third year in a row that the S.C. coast had received severe hurricane-related flooding, following Hurricanes Joaquin and Matthew. Now that December is well under way, Qualiariello and his colleagues at the National Weather Service have shifted their focus to winter weather concerns. According to Qualiariello, this winter is like to be a warm one in South Carolina, but that doesn’t rule out the possibility for dangerous winter weather conditions. To learn more about winter weather conditions, you can watch SCEMD’s press conference from Winter Weather Week here.